Diagram of a helium atom, showing the electron probability density as shades of gray. 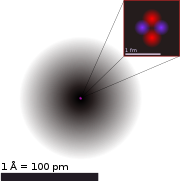 The atomic radius of a chemical element is a measure of the size of its atoms, usually the mean or typical distance from the center of the [(Atomic nucleus|nucleus)] to the boundary of the surrounding shells of [(electron)]s. Since the boundary is not a well-defined physical entity, there are various non-equivalent definitions of atomic radius. Three widely used definitions of atomic radius are: [(Van der Waals radius)], [(ionic radius)], and [(covalent radius)]. Depending on the definition, the term may apply only to isolated atoms, or also to atoms in [(condensed matter)], [(covalent bonding|covalently bonding)] in [(molecule)]s, or in [(ionization|ionized)] and [(excited state)]s; and its value may be obtained through experimental measurements, or computed from theoretical models. The value of the radius may depend on the atom's state and context. Electrons do not have definite orbits, or sharply defined ranges. Rather, their positions must be described as probability distributions that taper off gradually as one moves away from the nucleus, without a sharp cutoff. Moreover, in condensed matter and molecules, the electron clouds of the atoms usually overlap to some extent, and some of the electrons may roam over a large region encompassing two or more atoms. The approximate shape of a molecule of ethanol, CH3CH2OH. Each atom is modeled by a sphere with the element's Van der Waals radius. For many purposes, atoms can be modeled as spheres. This is only a crude approximation, but it can provide quantitative explanations and predictions for many phenomena, such as the density of liquids and solids, the diffusion of fluids through molecular sieves, the arrangement of atoms and ions in crystals, and the size and shape of molecules. Atomic radii vary in a predictable and explicable manner across the periodic table. For instance, the radii generally decrease along each period (row) of the table, from the alkali metals to the noble gases; and increase down each group (column). The radius increases sharply between the noble gas at the end of each period and the alkali metal at the beginning of the next period. These trends of the atomic radii (and of various other chemical and physical properties of the elements) can be explained by the electron shell theory of the atom; they provided important evidence for the development and confirmation of quantum theory. The atomic radii decrease across the Periodic Table because as the atomic number increases, the number of protons increases across the period, but the extra electrons are only added to the same quantum shell. Therefore, the effective nuclear charge towards the outermost electrons increases, drawing the outermost electrons closer. As a result, the electron cloud contracts and the atomic radius decreases. In 1920, shortly after it had become possible to determine the sizes of atoms using X-ray crystallography, it was suggested that all atoms of the same element have the same radii. However, in 1923, when more crystal data had become available, it was found that the approximation of an atom as a sphere does not necessarily hold when comparing the same atom in different crystal structures. Van der Waals radius: in principle, half the minimum distance between the nuclei of two atoms of the element that are not bound to the same molecule. Ionic radius: the nominal radius of the ions of an element in a specific ionization state, deduced from the spacing of atomic nuclei in crystalline salts that include that ion. In principle, the spacing between two adjacent oppositely charged ions (the length of the ionic bond between them) should equal the sum of their ionic radii. Covalent radius: the nominal radius of the atoms of an element when covalently bound to other atoms, as deduced from the separation between the atomic nuclei in molecules. In principle, the distance between two atoms that are bound to each other in a molecule (the length of that covalent bond) should equal the sum of their covalent radii. Metallic radius: the nominal radius of atoms of an element when joined to other atoms by metallic bonds. Bohr radius: the radius of the lowest-energy electron orbit predicted by Bohr model of the atom (1913). It is only applicable to atoms and ions with a single electron, such as hydrogen, singly ionized helium, and positronium. Although the model itself is now obsolete, the Bohr radius for the hydrogen atom is still regarded as an important physical constant. The following table shows empirically measured covalent radii for the elements, as published by J. C. Slater in 1964. The values are in picometers (pm or 1×10−12 m), with an accuracy of about 5 pm. The shade of the box ranges from red to yellow as the radius increases; gray indicates lack of data. A graph comparing the atomic radius of elements with atomic numbers 1–100. Accuracy of ±5 pm. The way the atomic radius varies with increasing atomic number can be explained by the arrangement of electrons in shells of fixed capacity. The shells are generally filled in order of increasing radius, since the negatively charged electrons are attracted by the positively charged protons in the nucleus. As the atomic number increases along each row of the periodic table, the additional electrons go into the same outermost shell; whose radius gradually contracts, due to the increasing nuclear charge. In a noble gas, the outermost shell is completely filled; therefore, the additional electron of next alkali metal will go into the next outer shell, accounting for the sudden increase in the atomic radius. The increasing nuclear charge is partly counterbalanced by the increasing number of electrons, a phenomenon that is known as shielding; which explains why the size of atoms usually increases down each column. However, there is one notable exception, known as the lanthanide contraction: the 5d block of elements are much smaller than one would expect, due to the shielding caused by the 4f electrons. Essentially, atomic radius decreases across the periods due to an increasing number of protons. Therefore, there is a greater attraction between the protons and electrons because opposite charges attract, and more protons creates a stronger charge. The greater attraction draws the electrons closer to the protons, decreasing the size of the particle. Therefore, atomic radius decreases. Down the groups, atomic radius increases. This is because there are more energy levels and therefore a greater distance between protons and electrons. In addition, electron shielding causes attraction to decrease, so remaining electrons can go farther away from the positively charged nucleus. Therefore, size (atomic radius) increases. The electrons in the 4f-subshell, which is progressively filled from cerium (Z = 58) to lutetium (Z = 71), are not particularly effective at shielding the increasing nuclear charge from the sub-shells further out. The elements immediately following the lanthanides have atomic radii which are smaller than would be expected and which are almost identical to the atomic radii of the elements immediately above them. Hence hafnium has virtually the same atomic radius (and chemistry) as zirconium, and tantalum has an atomic radius similar to niobium, and so forth. The effect of the lanthanide contraction is noticeable up to platinum (Z = 78), after which it is masked by a relativistic effect known as the inert pair effect. La3+ > Ce3+ > ..., ... > Lu3+. There is a regular decrease in their ionic radii. There is a regular decrease in their tendency to act as a reducing agent, with increase in atomic number. The second and third rows of d-block transition elements are quite close in properties. Consequently, these elements occur together in natural minerals and are difficult to separate. The d-block contraction is less pronounced than the lanthanide contraction but arises from a similar cause. In this case, it is the poor shielding capacity of the 3d-electrons which affects the atomic radii and chemistries of the elements immediately following the first row of the transition metals, from gallium (Z = 31) to bromine (Z = 35). The following table shows atomic radii computed from theoretical models, as published by Enrico Clementi and others in 1967. The values are in picometres (pm). ^ Cotton, F. A.; Wilkinson, G. (1988). Advanced Inorganic Chemistry (5th ed.). Wiley. p. 1385. ISBN 978-0-471-84997-1. ^ Basdevant, J.-L.; Rich, J.; Spiro, M. (2005). Fundamentals in Nuclear Physics. Springer. p. 13, fig 1.1. ISBN 978-0-387-01672-6. ^ Bragg, W. L. (1920). "The arrangement of atoms in crystals". Philosophical Magazine. 6. 40 (236): 169–189. doi:10.1080/14786440808636111. ^ Wyckoff, R. W. G. (1923). "On the Hypothesis of Constant Atomic Radii". Proceedings of the National Academy of Sciences of the United States of America. 9 (2): 33–38. Bibcode:1923PNAS....9...33W. doi:10.1073/pnas.9.2.33. PMC 1085234. PMID 16576657. ^ a b c Pauling, L. (1945). The Nature of the Chemical Bond (2nd ed.). Cornell University Press. LCCN 42034474. ^ Bohr, N. (1913). "On the Constitution of Atoms and Molecules, Part I. – Binding of Electrons by Positive Nuclei" (PDF). Philosophical Magazine. 6. 26 (151): 1–24. doi:10.1080/14786441308634955. Retrieved 8 June 2011. ^ Bohr, N. (1913). "On the Constitution of Atoms and Molecules, Part II. – Systems containing only a Single Nucleus" (PDF). Philosophical Magazine. 6. 26 (153): 476–502. doi:10.1080/14786441308634993. Retrieved 8 June 2011. ^ Clementi, E.; Raimond, D. L.; Reinhardt, W. P. (1967). "Atomic Screening Constants from SCF Functions. II. Atoms with 37 to 86 Electrons". Journal of Chemical Physics. 47 (4): 1300–1307. Bibcode:1967JChPh..47.1300C. doi:10.1063/1.1712084.